It is common problem which occurs due to inflammation between the hip bone(femur) and covering tissue (IT Band) and can result in inflammation of the fluid sac (bursa)or tearing of the tendons that attachment to the bone in this area. 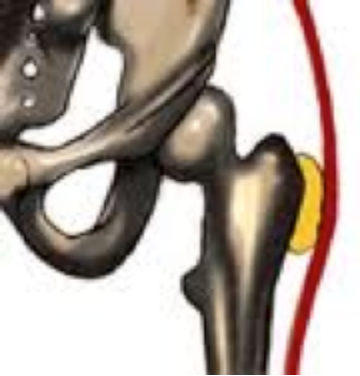 This typically causes hip pain on the outer aspect of the hip/thigh with pain along the IT band (side of the thigh). It can occur even after Hip replacement surgery if the hip is more prominent, with the scar on the outside or if the leg is made longer. Clinical diagnosis and occasionally MRI scans may be necessary for diagnosis. Most respond to physiotherapy and local injections. Persistent cases may require release by keyhole surgery (Hip arthroscopy) or more rarely but open surgery. In children the IT band can snap over the hip bone (Snapping Hip) which can be painful and occasionally requires the same treatment as above.